Quad-Core Processor - Fast Shipping! 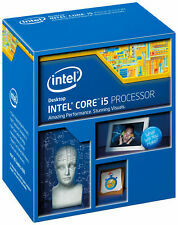 Intel Core i5-4690K 3.5GHz Quad-Core Gaming Processor. Condition is Used. Shipped with USPS Priority Mail. Trending at $112.50eBay determines this price through a machine learned model of the product's sale prices within the last 90 days. What is pictured is what you will be receiving. Does not include CPU Fan. Condition is Used(Like New, no visible blemishes). Good - Pulled from working machine. Intel Core i5-4690K 3.5GHz Quad-Core Processor. Condition is Used. This CPU is a working system pull and has been fully tested. If you have never done a CPU upgrade before, do not buy this CPU. CPU Fan and Heat Sink are not included. Make sure this CPU is compatible with your motherboard before you buy. CPU installs should be done by a trained computer expert (. ). Cooler only used for testing, so essentially new. Cooling Device. Thermal Design Power. Graphics Max Dynamic Frequency. Graphics Base Frequency. Max Turbo Frequency. Integrated Graphics. Virtualization Technology Support. Stepping is SR14E. Socket type is LGA1150, and it has built in. We tested this in a Dell Optiplex 7020; it booted up fine. IF ANY UNIT IS NOT AS DESCRIBED, WE WILL EITHER REPLACE IT WITH ONE EQUIVALENT OR BETTER. Intel Core i7-4790 Quad Core 3.6GHz LGA 1150 Processor CPU SR1QF. Condition is Used. Shipped with UPS. Notes: SR1CA, Pulled from a working desktop. Consign and Remarket Your Old IT Hardware Add a Custom Support Contract to This Item. Quad Core/3.20GHz/6M Cache/LGA1150. We are available for communications during these hours. Condition is Used. Works well. Processor Number i5-4430. Processor Base Frequency 3.00 GHz. Processor Graphics. Instruction Set 64-bit. Advanced Technologies. ‡ Up to 1x16, 2x8, 1x8 2x4. ( no international. USA only sorry !). -I do not have the original box anymore. However, the cpu will be backed with the oem plastic clamshell holder while wrapped in. Condition of the item Everything is in great condition. Processor is untested but came from a working environment. Intel Core i5-4590 3.3GHz Quad-Core (BX80646I54590) Processor. Condition is Used. Shipped with USPS First Class Package. Intel Core i5-4440 Quad-Core Socket 1150 (LGA1150) CPU Processor SR14F 3.10GHz. Condition is Used. Shipped with USPS First Class Package. 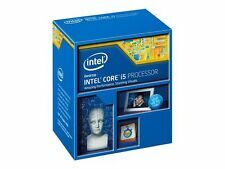 Intel Core i5-4670K 3.4GHz Quad-Core (BX80646I54670K) Processor. Condition is Used. Shipped with USPS Priority Mail. Ships same day! - Fast Shipping! 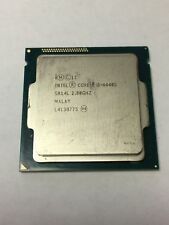 Intel Core i5-4590s - SR1QN - 3.0GHz CPU. Condition is Used. Pulled from working Dell workstation. 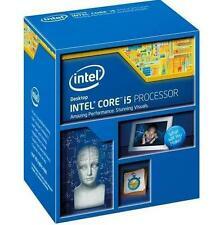 Intel Core i5-4690K 3.5GHz Quad-Core (BX80646I54690K) Processor. Condition is Used. Shipped with USPS Priority Mail. Intel Core i5-4690K 3.5GHz Quad-Core (BX80646I54690K) Processor. Condition is Used. Yes item has been OC before. Processor is still in good condition and has been reset to factor settings since being removed from mother board. Shipped with USPS Retail Ground. Intel Core i5-4690K 3.5GHz Quad-Core (BX80646I54690K) Processor. Condition is Used. No original box or inserts. Shipped with USPS Priority Mail. Processor Number. Processor Base Frequency. Processor Graphics. Processor Graphics ‡. Product Collection. Instruction Set. Instruction Set Extensions. Low Halogen Options Available. This is my i5-4690K LGA1150 CPU. It was pulled from my working machine because I upgraded to an i7. Used several hours for testing. Intel Core i5-4570 Quad-Core Socket 1150 CPU Processor SR14E 3.20GHz. Condition is Used. Shipped with USPS First Class Package. Trending at $71.00eBay determines this price through a machine learned model of the product's sale prices within the last 90 days. It has been tested on a compatible motherboard and is working great. L3 Cache: 6MB. Socket Type: LGA 1150. Number of Cores: 4. Southeastern data has over 20 years experience! Southeastern Data. I5 Proces sor. Processor Base Frequency 3.10 GHz. Bus Speed 5 GT/s DMI2. Cache 6 MB SmartCache. Intel i5-4590 - 3.30GHz - SR1QJ - LGA1150 `. Condition is Used. Shipped with USPS First Class Package. Processor only, no heat-sink or fan. Condition is Used. Intel Core i5-4670 3.40GHz . Condition is Used. Shipped with USPS First Class Package. Pulled from parted out machine.